The senators grilled Zuck for five hours. You’ve heard the rumblings over the years: Might Mark Zuckerberg make it to Washington? We’re pretty sure this isn’t the type of visit he had in mind. In the wake of Facebook’s involvement in the data-sharing scandal, Zuckerberg testified today before a joint session of the Senate Judiciary Committee and the Senate Commerce, Science, and Transportation Committee (at 10:00 ET tomorrow morning, he’ll be in the hot seat again, this time before the House Committee on Energy and Commerce). Zuckerberg already shared his written testimony, but during today’s live-streamed hearing, 44 Senators had five minutes each to ask him questions directly. The whole thing took about five hours. Here are the topics they batted around the most, and what both the Senators and Facebook’s CEO had to say about them. “If you and other social media companies don’t get your act in order, none of us are going to have any privacy any more,” Sen. Bill Nelson (D-FL) said during his opening statement. Given the nature of the Cambridge Analytica scandal (reminder: the third-party app used a quiz to get ahold of user data, as well as that of all of their friends), it’s not surprising that privacy was a hot topic throughout the hearing. Lawmakers tried to suss out exactly what Facebook knew about the Cambridge Analytical scandal, most of which was already covered in Zuckerberg’s previous statements on the topic. They also asked if he’d react differently if the data scraping happened today (yes, he would). At several points throughout the testimony, Zuckerberg attempted to clarify exactly what data Facebook collects and what it doesn’t. He frequently emphasized that Facebook does not sell user data. It collects data, and then gives advertisers access to the Facebook users that are most relevant for their products or services. 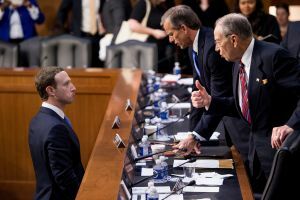 In one of the most overtly critical moments of the day, Sen. Maria Cantwell (D-WA) questioned outright whether Zuckerberg had the “will” to help Congress solve the problem of inadequate privacy protections. Zuckerberg told Sen. John Cornyn (R-TX), “I agree that we’re responsible for the content [on Facebook],” and a number of questions focused specifically on what kind of “content” actually showed up on the social media site. Several senators asked how Facebook is addressing hate speech. Zuckerberg noted that the platform is creating helpful artificial intelligence (AI) tools and hiring more native speakers to review content in non-English speaking nations. “I am very committed to making sure Facebook is a platform for all ideas,” Zuckerberg responded. Facebook attempts to police content that can cause “real-world harm,” such as terrorism, self-harm, or election interference, according to Zuckerberg. Sen. John Thune (R-SD) noted in his opening remarks that lawmakers may soon need to take more control in the tech industry instead of letting the companies mostly regulate themselves. As for what those that regulation might be, Zuckerberg told Graham he would “absolutely” work with lawmakers on crafting it, and that his team would follow up after (this, perhaps, was Zuckerberg’s most-often repeated phrase of the afternoon). He later told Sen. Amy Klobuchar (D-MN) that a rule requiring Facebook to notify users of a breach within 72 hours “makes sense” to him. He also supports having a law that makes “opt in” the standard for data sharing. User Trust: Sen. Thune questioned why users should trust Facebook, asking Zuckerberg, “After more than a decade of promises to do better, how is today’s apology different?” In response, Zuckerberg noted Facebook’s recent decision to take a “more active view in policing the ecosystem.” He said people will have to judge the company by the results of those efforts. Election Interference: When asked what Facebook is doing to prevent foreign interference in U.S. elections, Zuckerberg once again referenced the company’s AI tools. He noted that Facebook has used the tools to identify fake accounts, helping prevent interference in the French presidential election and others since the 2016 presidential election. Robert Mueller’s Special Counsel: The counsel investigating Russian interference in the 2016 presidential election has contacted Facebook, Zuckerberg said. Mueller’s team hasn’t interviewed Zuckerberg directly, but others at Facebook have spoken to the investigators. Android Phones: When asked about Facebook’s phone-scraping scandal, Zuckerberg testified that Facebook can’t collect users’ call and text history through its Messenger app unless the user opts in. Facebook’s Future: A “version of Facebook” will always be free, according to Zuckerberg. Tune in tomorrow for Zuckerberg’s round 2 in the ring with the U.S. Senate.